Colleen Doering, who runs a small facilities maintenance business outside Orlando, Fla., said she and her husband were paying several hundred dollars a month less in taxes because of the new law. As a result, they recently decided to spend $10,000 on a landscaping project and started to plan a vacation. “My paycheck has increased, and if I see it in my paycheck, then I know my employees are seeing it in theirs,” Ms. Doering said. Rep. Keith Ellison (D-MN)': "I would not describe it as crumbs," Ellison told Business Insider. 'The income inequality is so bad that if you could pick up 1,000 or 900 bucks, maybe it helps." Rep. Ben Ray Luján (D-NM), chairman of the Democratic Congressional Campaign Committee: "I recognize that something was in there. And where I come from, anything makes a difference," Luján told CNN. Rep. Joe Crowley (D-NY): "I think for people making $40,000 a year, any increase in their take-home is significant for them, and I don’t want to diminish that at all," Crowley said at a press conference. Rep. Henry Cuellar (D-TX): "'I would not use crumbs personally, and I think a lot of Blue Dogs would not use crumbs," Cuellar told Politico. Rep. Emmanuel Cleaver (D-MO): "Language is important, and we have to be very careful that we don’t insult people by saying that the amount of money they get is crumbs," Cleaver told Politico. "We cannot be seen as patricians." John Yarmuth (D-KY): "I would say it differently," Yarmuth told the Washington Examiner. "I wouldn't say a couple thousand dollars a year is 'crumbs.'" House Minority Leader Nancy Pelosi (D-CA) stepped up her rhetoric regarding the GOP tax bill Tuesday, calling it “unpatriotic’ during a town hall in Texas. Yeah, it’s “unpatriotic”…is that why a majority of Americans now support it? 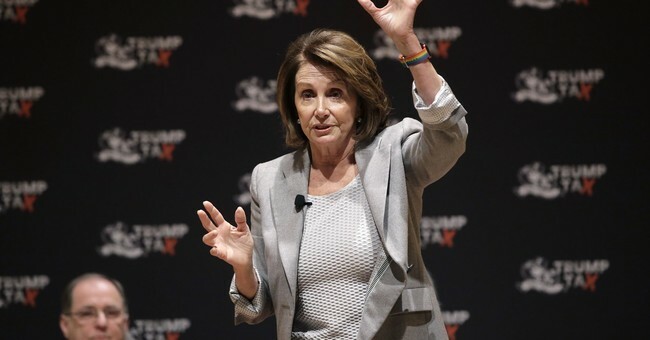 If I was a Democrat, I would be very worried that this woman, who has proven to be a serial failure when it comes to retaking the House, is quarterbacking the midterm effort. So, when Democrats can’t win, they just say whatever they’re against is racist or unpatriotic. Sounds like par for the course.